Wicked Dog is fun with your dog, even when your dog is sleeping. And you can share that fun with friends and their dogs. Wicked Dog lets you do three things: create a dogmoji that looks like your very own family dog, share the dogmoji on social media and elsewhere, and play games. You can play games that star your very own family dog animated to run, jump, dance, and more. You can even compete in games against friends and their dogs. You create your dog by choosing its length, heights, nose shape, tail length, and so much more. There are a hundred or so customization options with infinite variety. This isn’t a case of having to choose a particular breed that is sorta like your dog. With Wicked Dog, you get to make a whole bunch of anatomical characteristics reflect the unique look of your own family dog – whether purebred or mix – including its fur length and spots. Once you have the look you like, Wicked Dog will give your dog a thorough examination and use “anatomical intelligence” to automatically create a whole bunch of animations of your dog. We will make it sit, walk, run, wag, jump, dance, and much more. With your animated dog, you can send stickers, share to social media, and – we may have mentioned this before – play games! The screen has three areas: editor, animations, and kennel. The editor shows the currently selected dog and has buttons for everything you need to do. There are buttons for font, sticker shape, dog toy, dog creation, and of course, games. The animations show all the available animations for your dog. How do they get there? Here’s the key thing to know – you do not have to create them. Wicked Dog creates them automatically for your dog. It uses “anatomical intelligence” to know how to make your dog sit, wag, shake its paw, and much more. You don’t have to teach it, draw it, feed it, or anything else, because we know how to make the head and neck and paws and tail and everything else move. The kennel is the collection of dogs on your device. The app includes a dozen or so dogs to show you some of the variety that’s possible with Wicked Dog. It also allows you to create and name your own that you can share with friends and use in the games. The Bounce game is simple fun, or it seems simple until you’re juggling too many balloons! Tap to have your dog bounce balloons into the air and keep them from popping on the ground. The balloon that’s in the air the longest sets the time record. For extra fun, choose a new dog toy from the main screen, and your dog will bounce that toy instead of the balloons. These toys come from the emoji on your device. The tennis ball is an obvious choice, but also try the flying disk, dog bone, football, and others. They’ll collide and spin and bounce in crazy ways. The Splash game lets your dog compete in the sport of deck diving! Tap to run, swipe to jump, and try to bump the toy. When you do, the target moves out for you to try a harder jump. If you miss three times, it moves back for an easier jump. Each dog in the kennel can set it’s own personal record. Also, your dog will get better with practice, running faster and jumping farther. Agility competitions are popular throughout the world and even shown on TV. With Wicked Dog, your dog can compete, too, and you can even create your own courses and compete with other dogs around the world. Every course has a practice and race mode. In the practice mode, hints will be displayed to show you how to interact with the obstacle, whether tapping something, jumping through, or jumping over. Pick or make your favorite course and race on it for your best time. And then open the Messages app and use the Wicked Dog Stickers app (included with Wicked Dog) to challenge friends to an agility course competition! Go back and forth trying to beat each others’ time. Warning: Agility is not always easy. Getting through a course without penalty time takes some skill and practice. Hey, you’ve been warned! Bonus: There’s an obstacle that changes automatically with the seasons and with holidays. Your dog can compete in Agility against friends and other players around the world! Use one of the built-in courses (Amber, Opal, Jade, etc), and tap the Game Center button to find other players. Using Apple’s Game Center, invite friends to play or let Game Center match you with other players. When the match is accepted, Wicked Dog creates a three-race match of up to four players. It will show you the times for each dog for each race, plus the total time of all three. That total time will be added to a Worldwide leaderboard so you can compare your dog’s speed to that of everyone else playing. There are also achievements to reach for playing courses without any penalty. Your dog has to beat the current course record before you can send it to – and trash talk – friends. You’re the course designer in Agility, and you can make courses as easy or difficult as you wish. Just tap the game button and then the editing button on the main screen, and you can select, move, add, and delete obstacles. A hint for designers is to use grass to space the obstacles for more or less difficulty. A design that’s especially difficult is to make the dog run fast, such as through the tunnel, and then slow down quickly to jump through the hoop. That’s guaranteed to frustrate the friends with whom you’re competing. Six standard courses are included. They are named after gemstones, and the harder the stone, the harder the course. When you play these courses against friends, your best scores are added to the Game Center worldwide leaderboard. The Wicked Dog toy makes an appearance in every Wicked Dog game. In Bounce, it falls from the sky, in Splash, your dog tries to bump it before splashing into the water, and in Agility, it’s the target of a jumping obstacle. And you can customize the toy by picking an emoji! Tap the bottom button, and select a new toy from the collection. To add your own, tap the +, and then tap any emoji to add it to the collection. In this way you can use a pumpkin toy in Autumn, a heart for Valentine’s Day, or a bone any time at all. What makes Wicked Dog unique is that you can create an dogmoji of your own dog. The games are much more fun, and the stickers are much more interesting, if they star the dog you adore more than anything else. Tap the edit button to open a wealth of customization features. Then tap on the buttons to customize the dog’s shape, fur, banding, and spots, using the revealed controls to make things bigger, smaller, angled, etc. Tap the checkmark when done to save your choices. Hint: To share your dogmoji, either with friends or another of your iOS devices, tap the copy button on the right. The dog’s DNA is copied and can be texted to others and pasted in their Wicked Dog app. The kennel is where all the different dogs stay, and of course it’s a humane kennel with lots of grass and sky and toys and love. Select a new dog by tapping it. Add a new dog – it’s a duplicate of whatever dog you’ve currently selected – by tapping the big + button and naming the dog. Update and delete the dogs you customize by tapping-and-holding one of those dogs. Another sticker pack? A couple dozen stickers someone else created, which you can't change in any way? That you can't make the color you want, or can't make express the emotions you want? Heck no! These are not just stickers, but custom stickers – including selfie stickers – that you create! Make your own stickers to match your own mood. 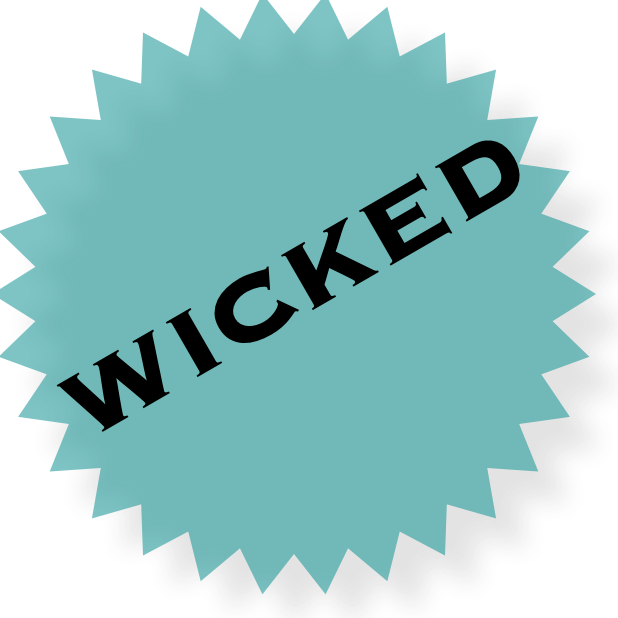 Wicked Custom Stickers' unique one-step automated selfie design technology provides users with the ability to create stickers from photos that may include selfies, pictures of pets or any other images that a user chooses. How many stickers? Dozens? No. Hundreds? Not even close. Try BILLIONS. For any text you type, for any selfie you take, Wicked Custom Stickers lets you pick shapes, animations, logos, badges, and special effects in more than 4 billion combinations. Tap Stickers to see all of your stickers and add them to text messages. Tap Build custom stickers to create all new ones. Tap the camera to take a photo to use as a sticker. After taking a photo, tap Stickers to see that photo as the background for all of the stickers you created. Tap the tag to see just those stickers that match some theme instead of all of them at once. Wicked Custom Stickers shows all the built-in stickers plus the ones you create in a scrollable list. Press a sticker and drag it onto a message to send it to that person or group. With the buttons and gadgets on the screen, you can change the font, color, darkness, and size of your stickers. You can also add logos, animations, and special effects. Type up to three lines of text. Drag the sliders to make the text larger or smaller. The lock determines if all lines adjust at once or line-by-line. Tap Add now to add your new sticker to the list. Tap Edit list to delete or rearrange the custom stickers you built. When you're done deleting and rearranging, tap Build stickers to continue adding new stickers. Tap the shape button to pick from dozens of shapes. Add our custom animations to your custom stickers, and your stickers will be as moving as your words! Tap the Font button, select a text animation, and that's it. Or tap the special effects (fx) button, and select from dozens of animations. When you peel a sticker and add it to a message, the recipient will see your message in motion. Bam! A logo can personalize your stickers to express your personality or passion. Logos apply to all stickers – prebuilt and custom – and you can change it at any time. Tap the extras (*) button to see all the possibilities. You can use your monogram or one of the dozens of images provided with Wicked Custom Stickers. Tag stickers to control which ones display. Showing just the ones with the "friendly" tag or a "work" tag allows you to display and find stickers faster. To add a tag, just type a word when you create the sticker. To use tags, select from the list of tags and then tap the Stickers button to display just those that match the selected tag, or even one particular sticker.